Home Companies Guangzhou True Scent Arts & Crafts Co., Ltd.
A scented candle, made with fragrant oils mixed into wax, gives off a pleasant aroma when burning. A scented candle is a nice touch in a bathroom, or any room of the house. A scented candle can create an ambiance of healthfulness and well-being. Unlike, scented candles do not add smoke into the air. 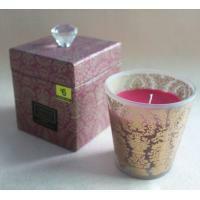 Our main product for scented candles is glass jar candle. All are made with Paffin wax or natural soy wax, which is depends on your need. Various scents could be supplied, while popular scents include apple, green tea, cinnamon spice, ocean mist, lemon, coconut, chocolate, jasmine. True Scent, with its headquarter TRUE SCENT GROUP LIMITED, was established in 1999, has been focusing on aroma & perfume products and accessory industry for more than ten years. It has developed from an initial gift factory to a diverse manufacturer and trader. Our company currently boasts a design and development team, quality control personnel, and a manufacturing facility, all of which meet the highest international standards. Our company enjoys a high reputation in the domestic and overseas markets.We are continuously develop new designs for extend more and more markets.